For the fourth straight season, I made preseason predictions as to how I felt each division would play out, and for the fourth straight season I was extremely far off. For one reason or another, I’m not very good at making division predictions before a given season begins. This year, though, I hope to finally correctly predict how the postseason will play out. While I’ll likely be off, either by a little or a lot, it’s always fun to make predictions. Who knows? Maybe I’ll get lucky and have a perfect prediction of how the postseason will play out. You never can tell what may happen in October. It’s somewhat difficult to pick a winner of this matchup. Neither one of these teams were locks to make the playoffs at all when the season began, and yet here they are. I would have to say that the Astros’ lineup has more thump in it than the Yankees by a bit, but when it comes down to it, I think the bullpen will decide this game. 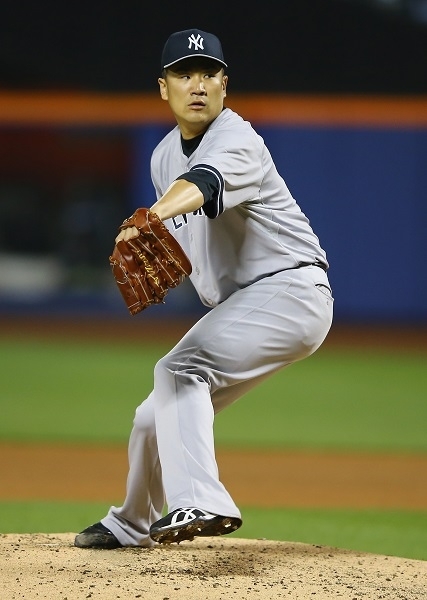 With Masahiro Tanaka going up against Dallas Keuchel, the relievers could very well be the ultimate factor. With that said, I think the Yankees will be able to hold off the Astros and advance to the next round. This is another tough one to call. With it being just one game, and with Jake Arrieta going up against Gerrit Cole, you can basically flip a coin to pick which team is more likely to win. Overall, though, I think that the Cubs will have the added motivation of trying to break the century long World Series drought that will help them prevail. Even so, this is sure to be one of the best games of the entire playoffs when all is said and done. Both teams have great lineups, and each has the ability to make this an unforgettable game. The Rangers have a good pitching staff as well as a good lineup, but they are quite simply no match for the Blue Jays in my mind. I could easily see this being a three-game sweep by the Blue Jays if Toronto’s pitchers can pitch well. 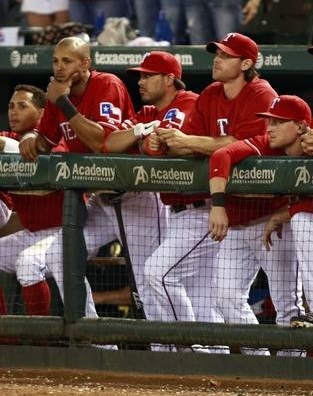 Their roster, consisting of unbelievable power throughout the lineup, is more than enough to dominate the Rangers. Although the Rangers made an impressive run to even make it into the playoffs, their run will likely end in the first true round of the 2015 postseason. After making it all the way to the World Series in 2014 — they lost to the Giants in game seven — I think the Royals will easily overtake the Yankees. The Royals have a strong team in every single aspect. From their pitching staff to their bullpen to their extremely diverse lineup, the Royals are a very formidable club. Although I’m not sure they will make it to the World Series as they did in 2014, I think they will have no problem overtaking the Yankees, despite the Yankees being a good team as well. This is going to be a series for the ages. The Dodgers have one of the best one-two pitching staff punches in baseball history, with Clayton Kershaw and Zack Greinke, and their offense is one that can score a lot of runs. Likewise, the Mets have a deep pitching staff that starts with phenom Matt Harvey, and they can score runs with the best of them as well. I could see this series going down to a game five, with the team that scores first being the team that holds on to advance to the Championship series. Unfortunately, this is where I see the Cubs’ hopes for a 2015 World Championship coming to an end. They are a good team, as I previously stated, but I don’t think they can withstand the team with the best record from the regular season. The Cardinals are a great team, and they know how to win. I think they will continue their winning ways and push on to the next round of the playoffs. Despite that, it should be fun to watch the Cubs put up a fight to take out the Cardinals. If absolutely everything goes perfect, they could do it, but I just don’t see that happening. What a series this would be. Both teams are dynamic, and both teams are very talented. However, both teams can’t win. With that said, I think it will be back and forth series in every sense of the word. I think this series will take six or seven games to decide, and it will be extremely exciting to watch. In the end, however, the Jays have an extremely good team, and I see them knocking the Royals out of contention. Although the Blue Jays haven’t been to the World Series since 1993, I have them making it there this year. Another sure to be great series against two great teams, this is yet again a nearly impossible matchup to predict (as many of them are). It could honestly go either way, depending on an exponential number of factors. It will all come down to who is hot at the right times and which team comes up with the clutch hits. But if Kershaw can hold up against the Cardinals (something history has shown he’s had a difficulty doing), I would bet my money on the Dodgers. They have the ability to make it into the World Series. If the Blue Jays can’t score runs they can’t win games. That’s the logic I’m using for trying to predict the World Series. Going up against the Dodgers’ unbelievable pitching staff, it may be difficult for Toronto to come out on top. The Blue Jays’ strength is undoubtedly their power bats, which the Dodgers don’t have as much of. But the Dodgers have more than their share of good pitching, which is what usually has the edge. When all is said and done, and the season has completely come to an end, I see the Dodgers as the only team remaining, as World Series Champions. Leave a comment with who you have winning the World Series. I’d love to hear your picks. From one year to the next, you never truly know what to expect in any given division race around baseball. Sometimes one team will completely blow away the rest of the teams in their division and run away with the first place spot, while other cases see multiple teams within a few games of each other down to the last game of the season. This year is more of the latter. Of the six divisions, four of them have the second place team within three games of the first place squad (the Royals and Cardinals lead their divisions by a good margin). Furthermore, some of the teams closing in on first — or in some cases leading the division — haven’t been doing so well in quite a long time. The biggest example of that being the Astros and Mets. Each are leading their given divisions at the current moment, and each are making their push towards the playoffs years earlier than many people thought they would. With the Angels a mere one game back of the Astros and the Nationals a game and a half removed from the Mets, the remaining games of the season should be exciting as we find out which teams can hold on to their hot seasons. Although not in first place (at least not yet), the Blue Jays are another team that is making things very interesting in the race for first place. The Yankees, somewhat surprisingly, lead the American League East at the moment, but the surging Jays are right on their tail, at just one and a half games back. With the lineup they have, Toronto has the ability to overthrow the Yankees as the season progresses. The Dodgers are also in the mix as far as exciting division races are concerned, despite still holding a two and a half game lead over the Giants for first. Even so, the Dodgers have been in somewhat of a slump lately (as have the Giants) and things could quickly switch around in the NL West. No matter what happens over the coming several weeks as teams push towards October, the fact that so many teams that weren’t expected to make the playoffs in 2015 are currently on their way to doing just that is exciting. If the season ended today, the Yankees, Royals, Astros, Blue Jays, Angels, Mets, Cardinals, Dodgers, Pirates and Cubs would all be headed to the postseason. With the Astros not having made the playoffs since 2005, the Mets since 2006, Cubs since 2008 and the Blue Jays since way back in 1993, this could turn out to be the season a lot of droughts could be broken for a lot of teams. That’s worth looking forward to. The Yankees officially fell out of playoff contention on Wednesday, making it just the first time since the 1992-1993 seasons that they have missed the playoffs in back-to-back years. But at Yankee Stadium on Thursday night, no one cared. There was a far more important reason that 48,613 fans (the most at any game this season) spent thousands upon thousands of dollars to jam pack the ballpark. The reason was Derek Jeter. Playing in his first home game in which the Yankees were eliminated from the playoffs, Jeter went into this game knowing it would be his final game in New York of his career. Even with that on his mind, the .313 career hitter at Yankee stadium was still able to block out his emotions for the most part (something he’s been able to do extremely well over his career) and focus on the one thing he’s been concerned about for years — winning. But things didn’t start off as planned, as the first two batters of the game went deep to give the Orioles a quick two-run lead. Taking the fans from an electric crowd to a somewhat stunned crowd, you still figured this was far from where things would end. 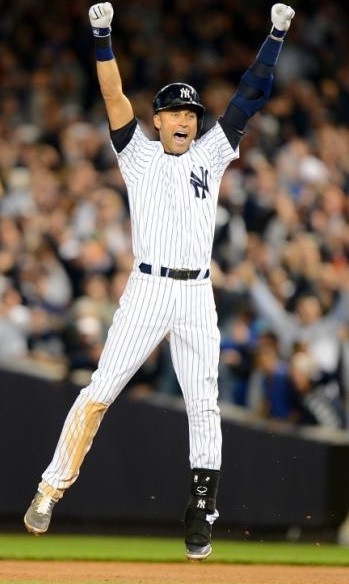 Not in Jeter’s final game in the Bronx. 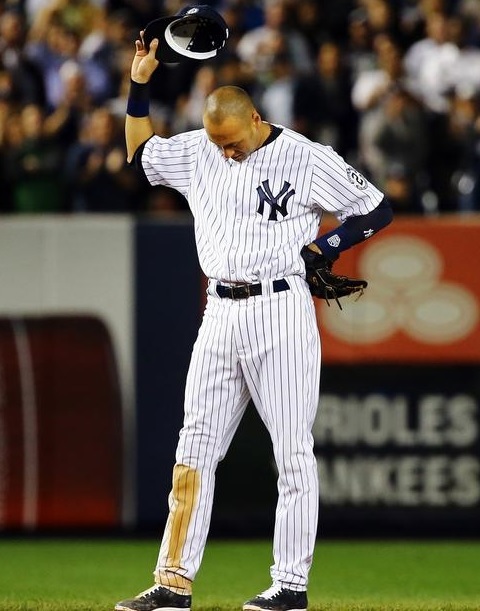 As has happened from stadium to stadium throughout this season, due to his preseason announcement that 2014 would be his final year, Jeter received a standing ovation when he made his way to the plate for his first at-bat of the night. The fans knew this would be one of their final opportunities to thank Jeter for the memories, and they took full advantage of it. But the memory making wasn’t done. Not by a long shot. After working the count a bit, Jeter drove a 3-1 fastball from Kevin Gausman deep to left center, and although everyone immediately thought it was a home run, the ball hit off the wall, allowing Jeter to coast into second with an RBI double — the 544th double, 3,462nd hit and 1,308th RBI of his career. You got the feeling that this was going to be a magical night. However, the second and third at-bats of the night weren’t much to write home about for Jeter. A weak ground ball which resulted in a a fielder’s choice and a swinging strikeout, respectively, Jeter appeared to be headed for a memorable but fairly uneventful evening as the game rolled on. But things would quickly change for The Captain. Coming up with the bases loaded in a 2-2 ballgame for his fourth time at the plate, Jeter grounded to fellow short stop, J.J. Hardy, who made a wide throw to second base, allowing two runs to score on the throwing error. 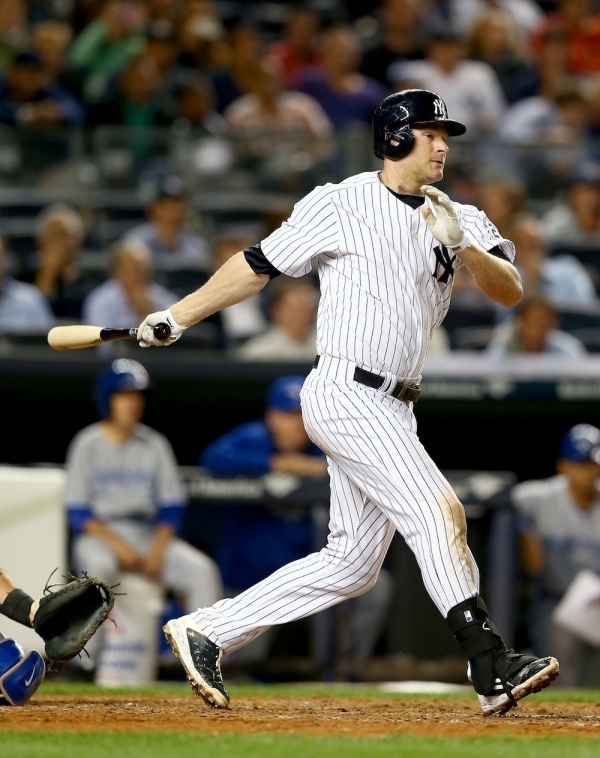 The score became 4-2, Yankees, with Jeter being responsible for two of the Yankees’ four runs. A sacrifice fly by Brian McCann then took the score up to 5-2, which is where things stood when the game moved into the ninth inning. Before the game even began, many people speculated as to when Derek Jeter would be removed from the game. Many felt it would be with one or two outs in the top of the ninth, but the chance to replace him never occurred. Yankees’ closer, David Robertson, came on and gave up a two-run home run to Adam Jones, followed by a solo shot by Steve Pearce, and just like that the game was tied. But no one seemed to panic as they normally would. One look at the lineup card showed that Jeter was due up third in the bottom half. After a single by Jose Pirela to lead off the bottom of the ninth (Pirela was promptly replaced by a pinch runner), Brett Gardner bunted the runner to second, bringing up Derek Jeter in a tie ballgame with one out. Wasting no time, Jeter took the first pitch of the at-bat the opposite way into right field, bringing around the game winning run — the first walk off hit for Jeter since June of 2007. With everything having to go exactly right, there’s absolutely no better way the game could’ve ended for Derek Jeter. He’s a legend — simple as that. Going down as one of the best short stops in history — right up there with Ozzie Smith, Cal Ripken Jr., etc. — Derek Jeter will be remembered forever. Not only as one of the greatest to ever play his position, not only as one of the greatest Yankees to play the game, but also as one of the greatest human beings to play the sport. Putting together a near spotless career on and off the field, few will argue that you will never see a player quite like Derek Jeter ever again. And the fans let Jeter know it when he walked back onto the field after getting the game winning hit. Joined by fellow Yankees legends, Mariano Rivera, Joe Torre, Jorge Posada and Andy Pettitte, among others, Jeter took the time to thank the fans for their support, tipping his cap before taking off down the dugout steps and through the tunnel for the final time of his career. Playing his entire twenty year career for the Yankees, the first ballot Hall of Famer didn’t have a whole lot to say after the game. As has been the case over his career, Jeter never says more than he wants to say. But he did let his emotions show through a bit, tearing up a bit at times. When asked what he would miss most, Jeter responded, “Everything. But most importantly, I’m going to miss the fans. They’re what made this special”. 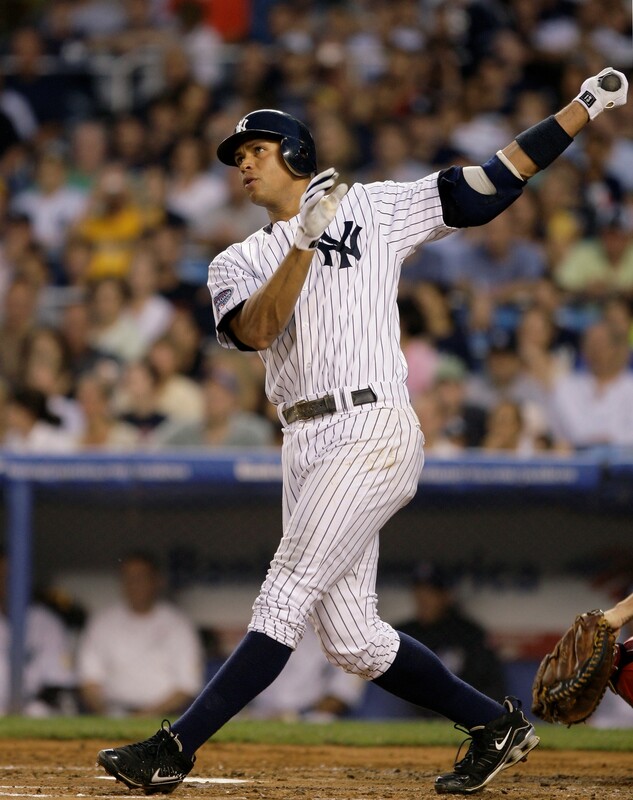 The 1996 American League Rookie of the Year, fourteen time All-Star, five time World Series champion, and sixth place player on the all-time hit list accomplished nearly everything he ever dreamed of doing on a baseball field. Growing up, all Jeter ever dreamed of was being the short stop for the Yankees, and he was able to do just that. Dreams really do come true. With that being his ultimate goal, Jeter made it official after the game that he will never again play short stop, saying he’s going to play in the final three games of the year up in Boston out of respect for the fans, but merely as the designated hitter. Inevitably each and every Major League Baseball season a handful of teams fail to live up to expectations placed on them at the start of the year. Whether a team simply doesn’t play to the best of their ability, or if it’s injuries that keeps them from performing well, a few teams always end up short of where they were projected to finish the year. The Diamondback’s, Rangers, Red Sox and Rays are all examples of that from the 2014 season. People from all over the baseball world selected the majority of those teams to make solid pushes at the postseason, but all of them but the Rays are going to finish dead last in their division (the Rays will finish fourth in the American League east). Truly disappointing endings for what were supposed to be promising teams. On the flip side, a few teams that no one saw coming always go on a major run in any given year, passing big time teams, and leaving many people scratching their heads as to how they’re doing it. But while the winning streaks of underdog teams are always exciting, a lot of those type of teams can’t keep up their torrid runs for an extended period of time, subsequently falling back down to their normal levels, and missing the playoffs. For the Marlins, Brewers and Yankees, they were those type of teams this season. No one saw them doing much of anything with the rosters they had going into the season, but they each went on runs at one point or another this season, proving a bunch of people wrong. None more so than the Brewers, who ended up being one of the biggest rise and fall team in years. After leading the National League central division for 150 days of the season, the Brewers went into a major, major slump. A slump that caused them to plummet through the standings, currently sitting five games back of the second Wild Card spot. With under a one percent chance of making the postseason according to MLB.com, the Brewers’ year is all but over, despite their great efforts. The Indians and Mariners are a couple of teams that are still in the race for the second Wild Card but are likely going to miss out, even after great runs this year gave their fans something to get excited about. Given under an eight percent chance of the postseason, it’s going to take an unprecedented string of events for either of them to make it in. But as has been proven time and time again with baseball, anything can happen.